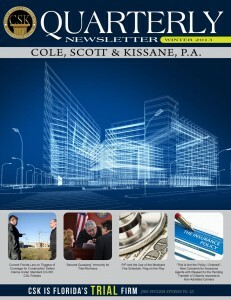 Florida’s First District Court of Appeal recently issued an important opinion regarding a Developer’s and Contractor’s liability for claims by an Condominium Association’s property insurance carrier for a subrogation claim after the Developer and Contractor entered into a release with the Association pursuant to certain warranty repairs. The appellate court affirmed the decision of the trial court in which summary judgment was granted in favor of Santa Rosa Beach Development Corp I (“SRBD”) and Ard Contractors, Inc. (“ARD”) in their defense of a subrogation claim by Landmark American Insurance Company, the property insurance carrier for the Beach Colony Resort on Navarre East Condominium Association, Inc. (“Association”). The Association sought damages for Landmark’s failure to provide insurance coverage for structural damages allegedly caused by Hurricanes Ivan and Dennis in 2004 and 2005. Landmark brought a third party claim against SRBD and ARD for subrogation. Upon execution and delivery of such warranties, Association, shall proceed directly against the manufacturer and applicator in the event any claim arises with respect to the sufficiency or adequacy of such repairs, or otherwise arising out of or relating to such repairs in any way, and shall make no claim against Developer (SRBD) or Contractor (ARD) with respect thereto. Following the Hurricane, the Association notified Landmark of losses sustained to the building. Landmark investigated the claim and determined that the water damage was the result of improperly designed and installed exterior cladding. Landmark’s policy excluded coverage for any “loss or damage caused by or resulting from…fault, inadequate or defective…design, specifications, workmanship, repair, construction…” After Landmark denied the claim based on the conclusion that the water damage was caused by the failure to properly install the stucco exterior cladding, the Condominium filed suit for breach of contract. After raising numerous defenses to Landmark’s third party complaint for subrogation filed against them, SRBD and ARD moved for summary judgment on the grounds that the Agreement released them from liability. After hearings on the motion, the trial court granted SRBD and ARD’s motions, and the appellate court affirmed. The courts specifically looked at the scope of the release, and determined that the release was for all work performed by SRBD and ARD to the defective stucco cladding and to correct damage caused by the water intrusion due to the defective stucco cladding. The repair work and release were not determined to be limited to the stucco, only. The Court determined, based upon testimony of Landmark’s own expert, that the release covered the same matters that were the subject of Landmark’s third party action. Contractors, developers, and design professionals should be cognizant of the breadth of releases entered into with the Condominium Associations, and must always look to obtain such a release when performing warranty repairs. In this matter, SRBD’s and ARD’s right to preclude the Association from seeking any claims against them arising out of the warranty repairs provided them a complete defense to a subrogation claim by the property insurance carrier. This perfect example of proactive defense, as opposed to reactive defense, was the difference between paying out on a subrogation claim and not paying at all!